You are currently browsing the archive for the 2009 AAG category. 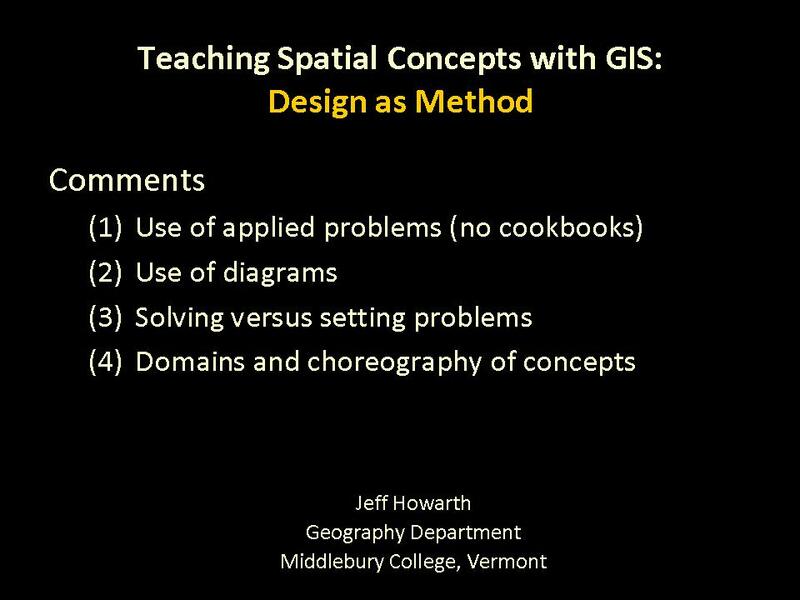 On March 24, 2009, I presented these comments at the 2009 AAG Annual Meeting in Las Vegas, Nevada as part of a panel discussion titled “Spatial Concepts and Curriculum for GIS and Design.” I connected ideas from the Specialist Meeting on Spatial Concepts in GIS and Design to the GIS curriculum at Middlebury College. I take a general definition of design as synthesis, or the process of applying the available means towards desired ends. 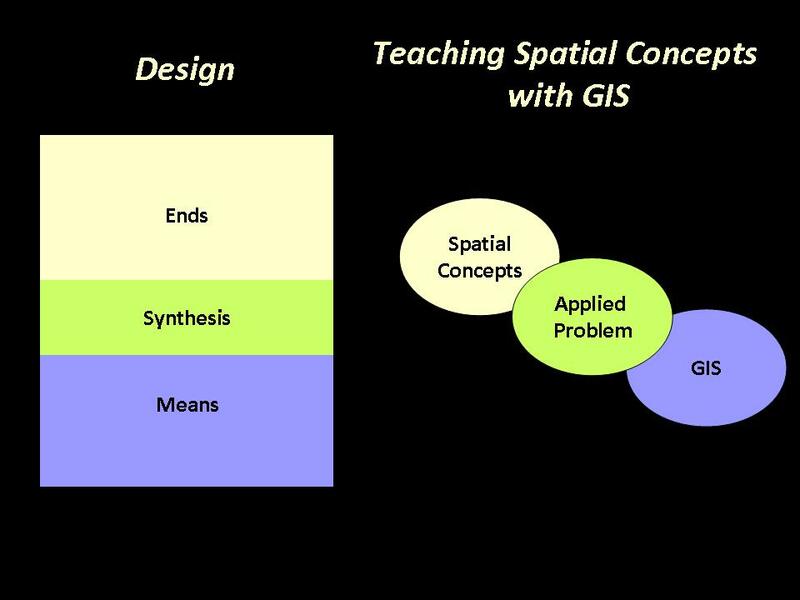 This view of design maps to a model of teaching spatial concepts where GIS is the means, spatial concepts are the ends, and an applied problem that students must solve independently is a synthesis, or the application of means to ends. This is a model for teaching GIS that I inherited from Bob Churchill. 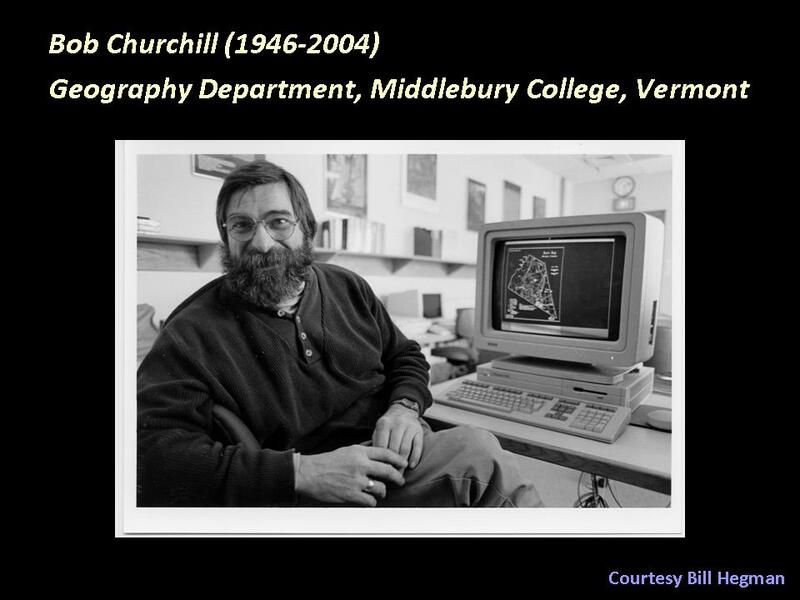 (Middlebury is Vermont, so you should date the picture not by Bob’s appearance but by the technology in the background). Bob began teaching GIS in the 1980s. Here is an example of one of his labs. 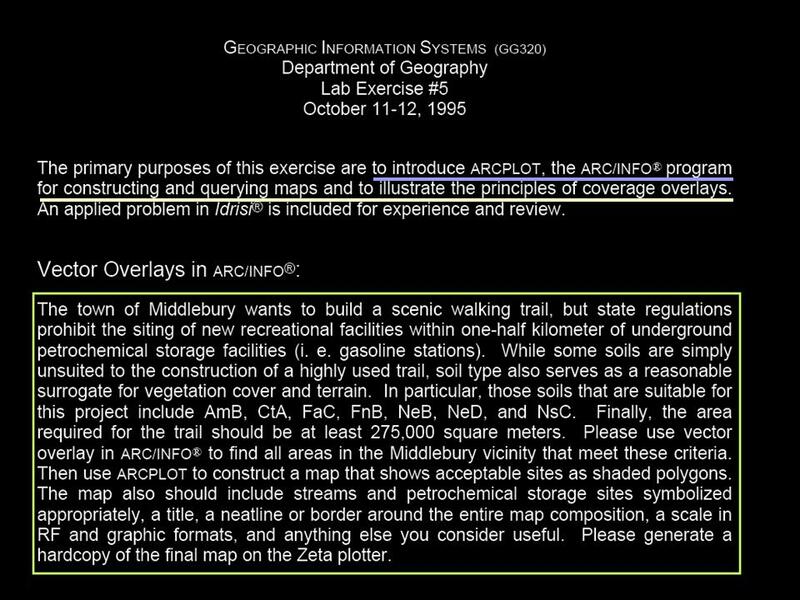 It’s structured so that the ends (yellow line) are to introduce principles and concepts of map display and overlay analysis. The means (blue line) are GIS tools. And the synthesis (green box) is an applied problem that the students have to solve on their own. In this case, the problem involves situating a feature given a set of constraints. With this approach, design is central to the teaching: students are given a real-world goal and the technical means and their task is to find a solution. Following the December workshop in Santa Barbara, I introduced a new element to this basic teaching model. This semester, I have the students make conceptual diagrams to elucidate their problem solving. 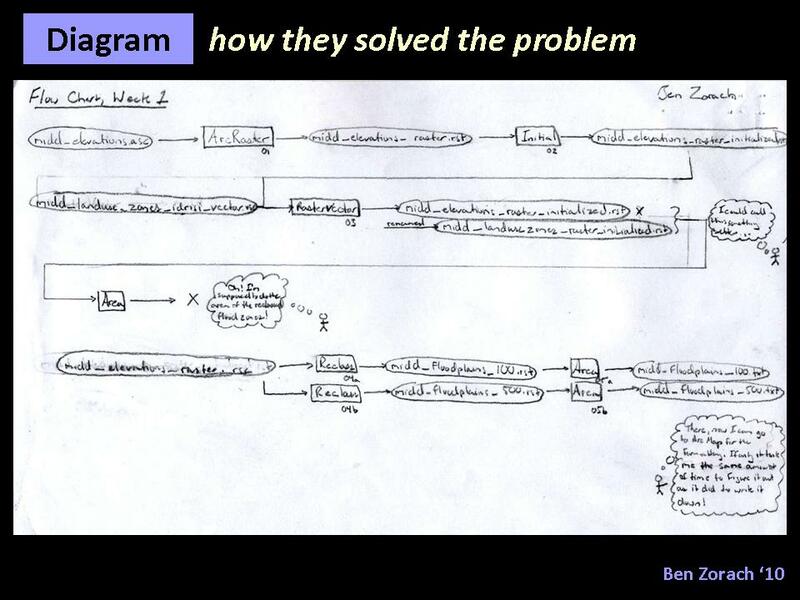 I ask them to draw how they solved the problem, including mistakes (which Ben shows here with bubble diagrams) to help them visualize the process of problem solving. I also ask the students to organize the operations according to common purposes or means. 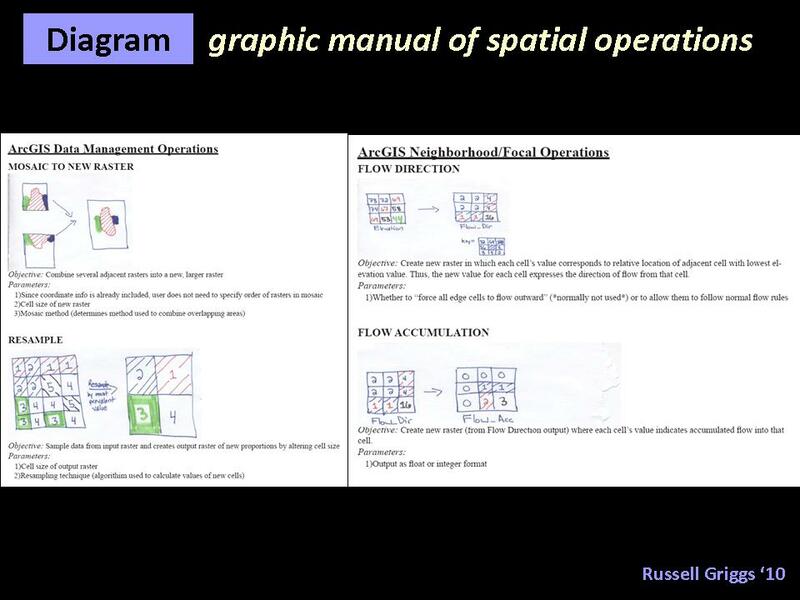 So they independently identify groups of operations, such as data management tasks versus focal operations, based on concepts that I introduce in lectures. From my experience, the student’s perspective of this teaching model differs from my own. 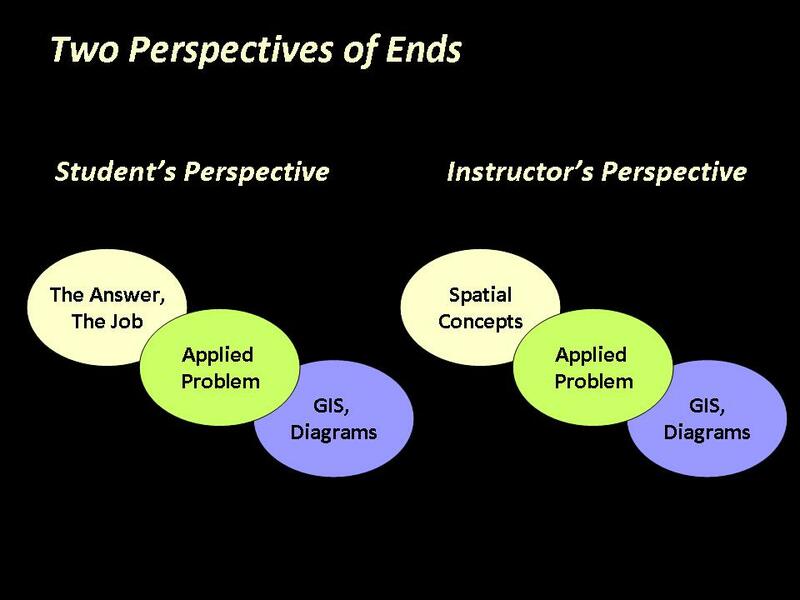 While my goal is to teach general spatial concepts, their goal is simply to find The Answer or perhaps to gain The Job. 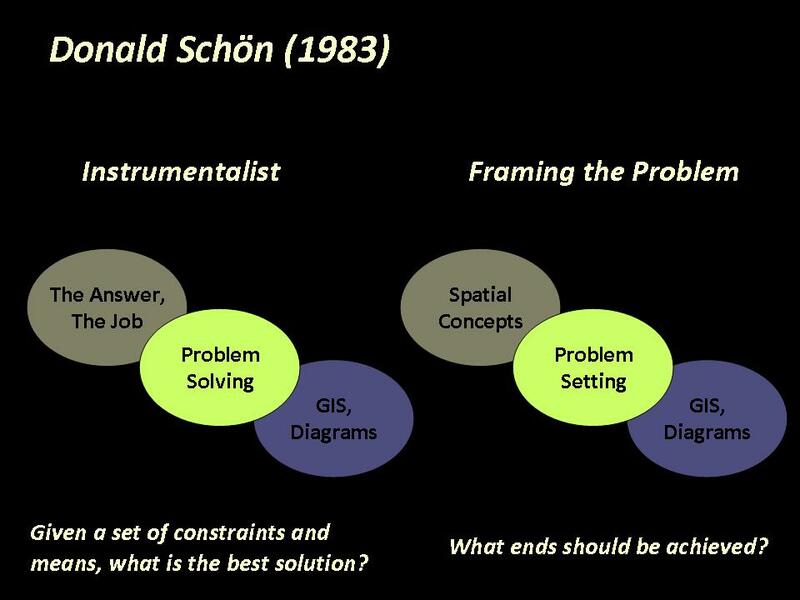 I think that these two distinct views mirror Donald Schoen’s (1983) dichotomy of problem-solving versus problem-setting. Problem-solving is the instrumentalist view of design, where the problem takes the form: given a set of constraints and means, what is the best solution? In contrast, problem-setting involves framing the problem, or determining what ends should be achieved. Now it could be that these two perspectives are chronological in a curriculum, where we begin by teaching the instrumentalist perspective and then transition towards problem solving at the level of undergraduate theses or graduate work. But problem setting is also our dilemma in curriculum development. So I think that this model helps define our problem in two ways. 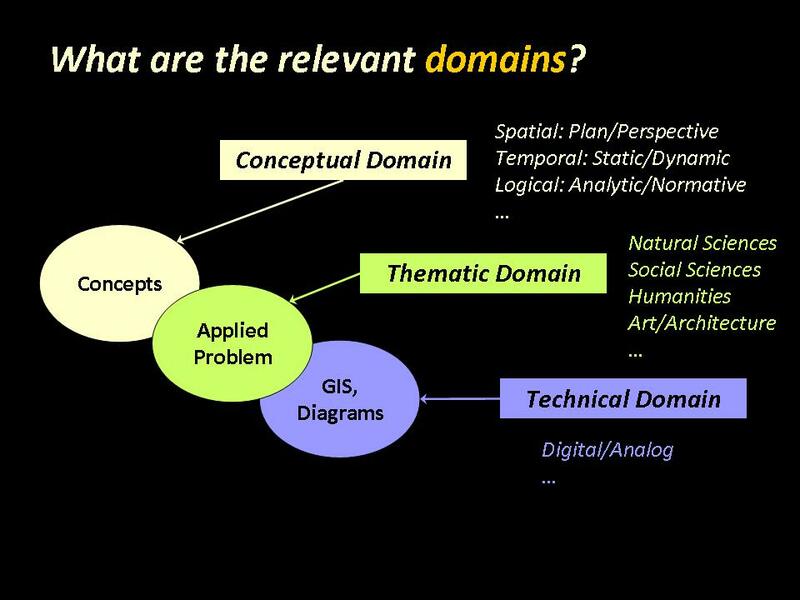 First, we can ask: what are the relevant domains for each component of the model? The conceptual domain should include not just spatial concepts, but also temporal and logical concepts, including the distinction between positive and normative logics. 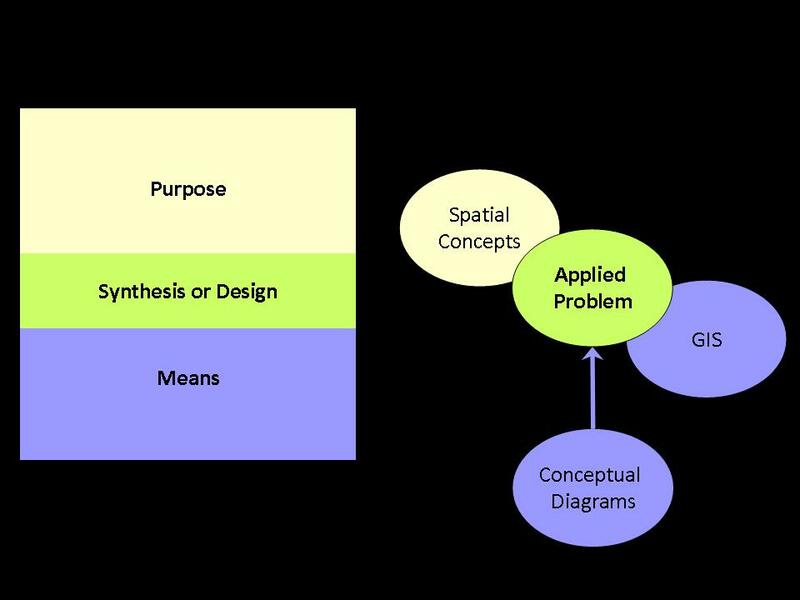 The thematic domain concerns what disciplines may contribute applied problems that involve concepts that can be solved with GIS and other spatial tools. The technical domain concerns the role of different kinds of tools, including both digital and analog approaches (such as hand-drawn diagrams). 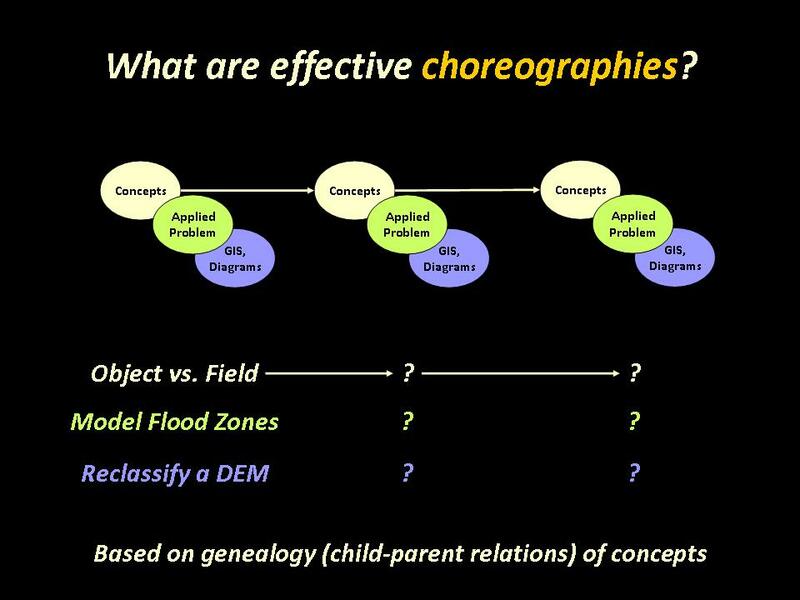 Secondly, we can ask: what are effective choreographies of this model over the course of a semester or quarter. This concerns how concepts should be sequenced. For example, my first lab teaches the concepts of objects and fields by having students model flood zones by reclassifying a DEM. I think that these are more primitive concepts that form the basis of more complex problems. So I think how we choreograph or sequence the content should be based on the genealogy (or child-parent relations) of concepts. Thanks to Ben Zorach, Russell Griggs, Yuki Yoshida, and Evan Mikkelson from Geography 320 Spring 2009 for sharing their diagrams and Bill Hegman from Department of Geography at Middlebury College.